When it comes to shipping a personal vehicle, which essentially can cover everything from a car, van, caravan, motorcycle or even a yacht, there are some specifics that one must be aware of. For one thing, it’s a complex procedure as you are shipping a personal vehicle from one country that has its own rules and regulations to another that has its own. Thus, knowing and understanding these fully is essential. We have put together the process of shipping a personal vehicle to make it simpler to understand the dynamics and what you should expect from the freight forwarder and what is expected from you. When you get in touch with Transco Cargo as your freight forwarder for the process of shipping a personal vehicle, there are several factors that need to be accounted for before you even start shipping a personal vehicle. Furthermore, there are some legal aspects that must be handled by you as the shipper. Thus you are in need of a freight forwarder that is reliable and is able to offer a variety of transport services such as picking up and loading the personal vehicle into the container, ensuring that its secured, as well as transporting it from your location in Melbourne and then taking it to the warehouse before its loaded onto the container vessel for the shipment to leave the port. In terms of documentation, as your freight forwarder, Transco Cargo will handle the prepping of all documentation and assist you in filling particulars of the export documents as well as insurance matters. Our agents at the destination port will also be able to do the needful in terms of collection of the personal vehicle cargo, as well as other documentation so that it will be released without a fuss. There are essentially two things to consider; the space needed and the shipping schedule. In terms of booking your cargo space for shipping a personal vehicle. You are able to ship your vehicle in 2 ways. One would be to drive it onto the shipping vessel (if its motorised), or opt to load it into a shipping container. It’s a matter of informing Transco Cargo of your shipment requirement. In terms of schedules, you can simply check out the shipping calendar to figure out when the next shipment from Australia to overseas is planned. Transco Cargo are professional freight forwarders with over 30 years’ experience in the logistics industry. They will instruct you on all documentation needed for shipping a personal vehicle, and also assist in filling them and submitting them to the necessary authorities. Get in touch with Transco Cargo to help in shipping a personal vehicle from Australia overseas. 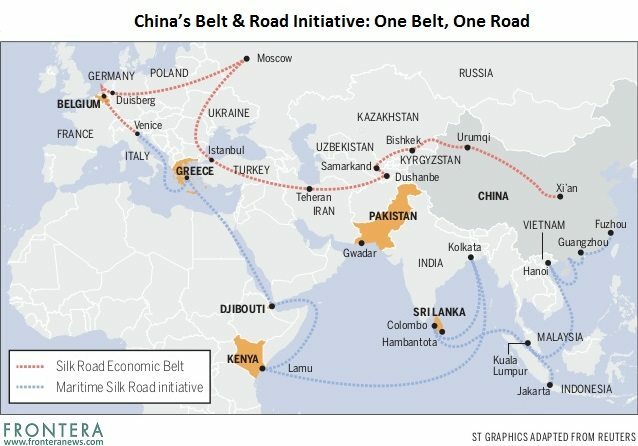 The OBOR, also known as China’s One Belt One Road Initiative is a strategic and economic agenda that will connect Eurosia, Africa and Oceania along two routes (maritime and on land). Supporters of One Belt One Road say that it will most likely aid economies in need with new infrastructure and economic aid, whilst some say that it will allow China to dominate the areas of which OBOR will pass through. This strategic and economic concept was derived by an amalgamation of the Silk Road Economic Belt and the Maritime Silk Road of the 21st century. Whist OBOR is being pitched in Australia as an economic opportunity, it also means that Australia-China ties will be increasing and strengthening, a closer look should be place on how OBOR will affect economic zones in the likes of Malaysia, Indonesia, Bangladesh, Myanmar, Pakistan, Kenya, Tanzania, Oman, Djibouti and of course Sri Lanka. The OBOR initiative is to bring together 35 countries with the setup of 75 economic zones with trade cooperation measures. Whilst many countries are being cautious, Sri Lanka has welcomed the One Belt One Road initiative with open arms. China’s One Belt One Road initiative comes as part of China’s integration into Sri Lanka with its current Free Trade Agreement along with policy coordination, connectivity and improved trade proceedings. With Sri Lanka’s geographical placement on the global maritime route and the OBOR, as well as other OBOR related project that are being developed such as the Colombo International Port City, the Hambantota Port and other real estate project adjoining Colombo Int. Port City, the OBOR Initiative has much value to the country. Through China’s One Belt One Road Initiative, Sri Lanka can benefit in various ways, such as with higher trade flows, growth in foreign investments, hard and soft infrastructure developments, integration of Sri Lanka into global value chains, tourism growth, technology & knowledge transfers, and employment opportunities. More importantly, as an impact to Sri Lankan logistics becoming an economic hub in the Indian Ocean. There are concerns and risks, as India too is vying for the spot of economic hub in the South Asia region, however, there needs to be balance and other means of strengthening relations with past strategic parents such as India and China both. Much like Kazakhstan, Sri Lanka too can garner positive impacts to become a trading hub, as well as reaching other markets that were before not as easy. By linking Pakistan, India, China, Central Asia, and Europe, Sri Lanka is able to supply products and maintain connectivity with the global market. A concern that will occur in the maritime route, would be maritime security and energy, as well sa understanding the OBOR initiative, as many of the policies are in Chinese. Furthermore, Sri Lanka debt burden with its poor Public Debt Management may be of concern too whereby China could benefit from the fiscal situation Sri Lanka has found itself in. If you are looking to send a Motorbike to a loved one to Sri Lanka, then you are in luck as the Sri Lanka Customs authority has included the likes of a motor cycle, auto cycle or scooter that is no more than 3500CC classified as a passenger baggage item which means that you can send a motorbike as personal effects category through Transco Cargo. However, a motorbike is not the only thing that has been added to the List of Permissible and Restricted Articles list. There are more additions which include the likes of the below, which can be sent along with your personal cargo when you send a motorbike as personal effects to Sri Lanka. The following includes the restricted articles which cannot be sent as personal baggage or effects. The progression of supply chain and logistics in global trade is ever evolving and thus, it is important to say on top of the supply chain trends that keep evolving, especially those that would affect your business model. The norm of warehouses is that at least 10% of the market deals with pallet shipping and of course pallets, whereas nearly 70% also facilitate small shipments, complete loads, split shipments and groupage services. However, with added labours costs and developments in channels and not to mention the growth in access and automate solutions, the means of which distributions centres and supply chain trends are developing and evolving too. The need for better warehouse management systems are being requested so that the smooth running of manual and automated processes can co-exist efficiently. Having said that, with these supply chain trends, you can expect that warehousing management will be more complex as freight forwarders in Australia and the world will be expected to do their part for the partnered customers. One of the most anticipated supply chain trends, it is highly applicable to those in the ecommerce trade whereby smaller storage or distribution centres will move closer to such business to make use of economies of scale, faster service levels, lower pricing models, and not to mention improved tracking. Online shopping drives the need for ecommerce logistics and improved strategies and models. Having said that, contact logistics can at times be tricky waters to navigate often with banks and lawyers becoming involved due to issues with payments. There are also concerns with traceability which will need to be improved on. Especially in the case of returns/defects. Furthermore, there is a great need for direct communication between suppliers, retailers, and customers in order to reduce issues. The answer to this may well be BlockChain Supply Management as the solution provider to aid in multiple aspects of Supply Chain Management. With these supply chain trends in light, you are able to make necessary changes to your processes to adapt and evolve with global trade evolution. A lot of business that trade in goods internationally make it a point to take on marine cargo insurance coverage because it safeguards their bottom line against losses for whichever reason (which we will talk about a little later in the blog). If you are planning on freighting goods overseas via ocean cargo during seasons in which hurricanes or storms are likely to hit, extra protection for your goods can come in handy to ensure that your business is safeguarded. However, it is a more different approach when it comes to personal effects and sentimental goods. Let’s find out what you should be prepared for and why you should request marine cargo insurance coverage when freighting goods overseas. Knowing that your goods are being shipped via vessels over the ocean, you need to take that into that in the event that the vessel hits rough seas or unfavorable weather, the packed goods within the containers, be it in shipping boxes or shipping crates, may end up getting “jostled” or may move around within. Due to this factor, all cargo within said shipping crate or shipping boxes needs to have been packed properly. This is essentially the first preventive measure or line of defense that you can take before you request marine cargo insurance coverage. By protecting your goods from the get-go, these are easy and cost effective ways in which you can safeguard your personal possessions or commercial goods. A freight forwarder clearly states their standard trading conditions, and a customer should take due precaution to read these as they state what they are liable and responsible for, and what the customer needs to undertake. The Transco Cargo Trading Conditions clearly state the terms, including the adequacy of packing, ensuring that proper branding is included pertaining to contents within, as well as what the freight forwarders liability entails. By understanding these terms, you are able to request marine cargo insurance coverage against risks that you may be open to. Thus, once you know exactly what your freight forwarder is offering you and what comes under a customer’s liability, you are able to partner up with a shipping insurance provider to get yourself marine cargo insurance coverage. All Risks Coverage is one that shippers can benefit from, which include protection against the likelihood of damages or losses due to a number of factors. The included aspects under All Risks Coverage are damages due to improper packaging, infestation, cargo abandonment, customs rejection, employee and dishonesty. Speak to our representatives to have you get in touch with our partner shipping insurance providers to request marine cargo insurance coverage for your next cargo shipment. Sea Cargo is one on the preferred modes of transporting of freight between countries for centuries. At first it was the only means of which goods could be bartered across the oceans, but nowadays, compared to the alternative of air cargo, sea cargo fares better due to its cost efficiency. However, if you really were to look at sea cargo, there are more dangers at sea than air, and as a sea cargo customer, you should be aware and understand that these are common occurrences and that is why you should get sea cargo insurance as the freight forward may not be liable for a variety of causes. In this blog post, we look at the reasons in which a lot of freight forwarders get a lot of heat on the basis of cargo damage at sea and why we always recommend you take sea cargo insurance as a probable mitigation measure. Risk, loss and damages are common when it comes to sea cargo as you should be aware that nature can easily change its temperament and an ocean cargo journey can be arduous. Thus, sea cargo insurance will be able to provide protection against all risks of physical loss and damage caused by external causes while shipping. Of course, you are able to for-go the sea cargo insurance and assume all risk by self-insuring but that is on the assumption that you have understood that in the event that your cargo has had some physical damage, the freight forwarder will NOT be liable. There are many ways in which cargo can get damaged during sea cargo and is often a common occurrence due to things like severe weather and high seas, accidents and even incorrect stowage. However, it can also get damaged when the shipping boxes and crates are not packed and packages properly, Thus, it should be said that if you opt to pack your own goods into shipping boxes and crates, it is it ESSENTIAL that you take into account all the necessary packing and packaging guidelines to avoid damages to your personal effects or goods that you want to sea cargo. General Average Loss – in the event of a loss of a container, the loss is written off over the entire load, and all the shippers of the sea cargo pay a calculate share. In the event of an emergency or safety to the crew – the captain of the vessel will make a judgement choice to jettison a few containers overboard, and for which you as the shipper will be liable to pay a percentage of the loss before goods will be released from the port. You can purchase cargo insurance to cover General Average Loss. If you have been following our blog for the last few weeks, you would have realised that we highlighted a few things that relate to sea freight transactions. Last week, we looked at “Sea Freight Shipments and Payment Terms” and highlighted the scope of incoTerms. In this blog, we’re trying to make things more transparent or even easier to understand at first glance. IncoTerms Rules can be hard to decipher depending on the scope that falls on the buyer or the seller when it comes to sea freight transactions. The following table looks at the IncoTerm Rules for sea freight transaction over the ocean as well as inland waterway transportation.